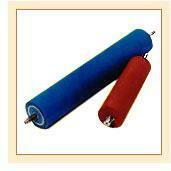 Rubber Rollers have different hardness (durometers) depending on applications. Rubber is chosen to make rollers because it does not adhere to adhesive. The choice of covering material is determined by the roller's environment and function. The hardness of the rubber roller may be as soft as a foam bed pillow or as hard as a bowling ball.